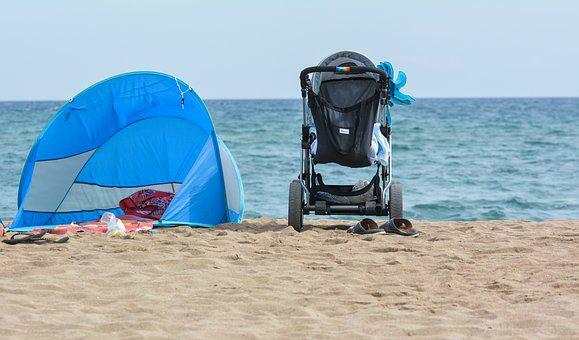 Summer is beach and pool time; of umbrellas and sun, of hammock but those which you have infants in home well you understand that when initiating this period of the year it’s necessary to take extreme care. If the increase in temperatures, UV rays or water affects adults, what impact can they have on the small ones in the home? Today we wish to transfer you a collection of basic suggestions to go to the shore with babies. Certainly you find them useful. Babies tend to remain well hydrated with breast milk available, even though it’s a good idea to carry a thermal bag with your water bottle, as well as (for slightly older infants ) sections and pieces of fruit (tangerines, orange, melon bits ), nectarine… ) abundant in fresh and water. Bear in mind that the smaller a baby is, the more risk he runs out of dehydration.